There was some unfounded speculations that after he left the governor's position that Arnold Schwarzenegger would pick up a weapon and stand on the U.S. / Mexican border to prevent illegal aliens from crossing - but he didn't, he's going back to acting. So you therefore have to hand it to fellow 80's action star Steven Seagal though, because next year he's grabbing a gun and going to do it instead! That's right, this is not, I repeat not Creedon's insane ramblings for the week this is real! In January 2012, Seagal will be swapping Louisiana for Texas where he has just been sworn in as Sheriff's Deputy this week to go out on patrol in Hudspeth County, which runs along the Rio Grande east of El Paso. Yes Seagal will be on the front line in the border wars against drug lords and to stop illegals from crossing the border, or at least a 98 mile long stretch of it. 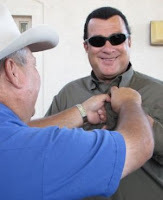 Seagal, 59, a 7th dan black belt in Aikido, will bring his martial arts prowess to bear in protecting the border, as well as offering up his expertise to train the other sheriff's deputies, working full-time to help secure the border Texas shares with Mexico. As you know from reading here that for the past couple of years cameras have been following him around Jefferson Parish, Louisiana where Seagal is a fully-commissioned Reserve Deputy Sheriff. What's the bet that those camera's will be heading Southwest now too? 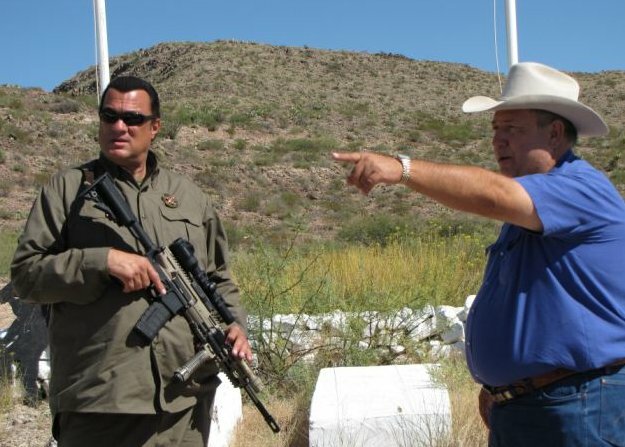 Oh no I doubt that Segal is that much of a Publicity seeking whoremonger...(sarcasm alert)I do love the way he's got the gun slung though as if he was posing for a photo...hmmmmm? I am torn though, I mean there is a serious problem right now on the Border involving drug cartels not helped by an idiotic atf plan backed by the Obama administration which accidentally ended up arming those cartels so I don't think having Segal on the border really helps...yet his show is truly the greatest unintentional comedy series ever made and I kinda want to see steve's "adventures" on the border. That should give the illegals a nice advantage when sneaking across the border and trying to avoid police patrols. Just watch out for the TV camera lights. I'm just watching this story on The Soup and noticed... you chose more flattering photos than they. What is Seagal up to? ?